As confirmed by Huawei Malaysia’s executive last week, Huawei has officially launched its first wearable device called the TalkBand B1. It might be different from your usual idea of a smartwatch though since the Huawei TalkBand B1 is actually a combination of wireless headset and fitness tracker in one. 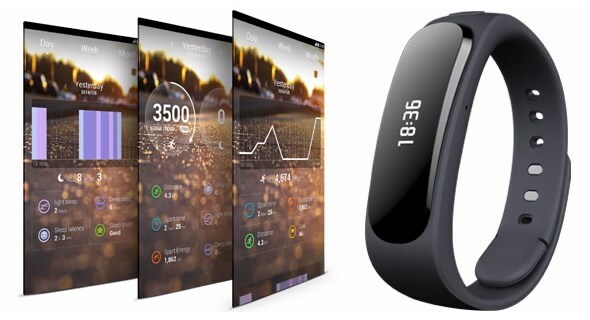 Build with a 1.4-inch flexible OLED display, the Huawei TalkBand B1 is designed as an companion to the newly announced MediaPad X1 although it does support devices with at least Android 2.3 and iOS 5.0 in general. Users is able to use the TalkBand B1 as wireless Bluetooth 4.1 headset for up to seven hours of continues calling or two weeks of standby through its 93mAh battery. It also supports syncing through NFC and can be fully charged within two hours with the built-in USB connector. The TalkBand B1 also vibrates automatically if the synced device is separated from it for more than 10 meters. Apart from that, it also tracks steps, distance and burned calories alongside duration and quality of sleep. Since it doesn’t come with a touch display, users will have to use the app on their smart devices to properly utilize the Huawei TalkBand B1. Since the Huawei TalkBand B1 also comes with IP57 rating, it is designed to be dust proof and water resistant. Priced at EUR 99 (RM 449) in Europe, the hybrid smartband will be released in China next month while Japan, Middle East, Russia, and Western Europe will receive it sometime in Q2 2014. No availability and pricing information for Malaysia at the moment though. For more details, head on to consumer.huawei.com.